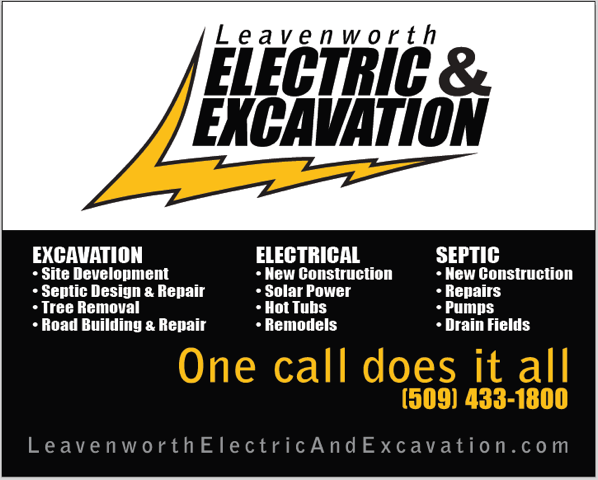 Leavenworth Electric and Excavation, Inc.
Our website address is: http://www.leavenworthelectricandexcavation.com. We use contact forms to respond to your requests for service which include electrical, excavation, solar and snowplowing. We do not collect personal information from you unless you voluntarily supply it to us. “Personal information” means information which identifies you as an individual, and may include your name, billing address, service address, phone number, email address, notes. Your information helps us to more effectively respond to your customer service requests and support needs. Generally, we collect personal and other information from you when you email us or contact us or fill out an online form. When you make a payment via our Website, you may be asked to enter your name, email address, credit card information, mailing address or phone number, as appropriate for the transaction. You may, however, visit our Website anonymously. We do not use the information submitted through them for marketing purposes.Your information, whether public or private, will not be sold, exchanged, transferred, or given to any other company for any reason whatsoever, without your consent, other than for the express purpose of delivering the service requested. If you want to stop or restrict the placement of cookies or clear any cookies that may already be on your computer or device, please refer to and adjust your web browser preferences accordingly. By deleting our cookies or disabling future cookies you may not be able to access certain areas or features and functionality of our Website. Additionally, we will share your personal information with third parties where required by law, where it is necessary in connection with our Services or where we have another legitimate interest in doing so. If we need to use your personal information for an unrelated purpose, we will notify you and we will explain the legal basis which allows us to do so. If you have left comments or filled out a form, you can request to receive an exported file of the personal data we hold about you, including any data you have provided to us. You can also request that we erase any personal data we hold about you. This does not include any data we are obliged to keep for administrative, legal, or security purposes. After a payment transaction, your private information (credit cards) will not be stored on our servers.